When I was a little girl, I loved any holiday where candy was involved. I was crazy about sugar and my mother didn’t allow many sweet treats in the house, so I really looked forward to those “special occasions.” Lucky for me, my auntie was all too happy to satisfy my sweet tooth whenever possible. She was and still is an unbelievable baker as well as a top customer at her local chocolate shop. You name the holiday, she had the matching sweets, especially on Easter, which was like sugar-on-steroids. There were small little foil-wrapped bunnies for our baskets, large chocolate boxed bunnies, jelly beans in every color of the rainbow, chocolate eggs and the best one of all — a ginormous chocolate-covered coconut egg. Imagine a moist, dense, sliceable orb of sweetened coconut covered in milk chocolate — I was obsessed with this confection! Believe me, I’m not trying to tempt you here. It was so sickenly sweet, I am sure if I had a bite of it today, I would be nauseous. Definitely not worth it! I’m no longer obsessed with that coconut egg (or candy, for that matter.) But since then, I’ve always associated Easter with coconut, which is funny because it’s really a season-less food. And in the last decade since I’ve been on the health food path, coconut has found it’s way to me in many forms, none of which is sweetened with sugar nor coated with chocolate-flavored sugar. Today I rely on unrefined coconut oil, coconut milk, coconut water and unsweetened shredded coconut and my body is much happier with me. So when I was coming up with a new Easter dessert a few years ago, coconut immediately came to mind. But since I also celebrate Passover with my husband’s family, I wanted something I could serve on that holiday, too, so no grains or flours allowed. Lastly, I wanted a delicious dessert that wouldn’t make me feel sick after I ate a slice. And this is what it really boils down to for me. I rarely eat sweets and when I do, I’m not looking for dessert to take care of my nutritional needs. So whereas it’s nice in theory to know I may be getting a few extra minerals from unrefined sweeteners and unprocessed ingredients, I just want a tasty treat that doesn’t make me feel like hell afterwards. 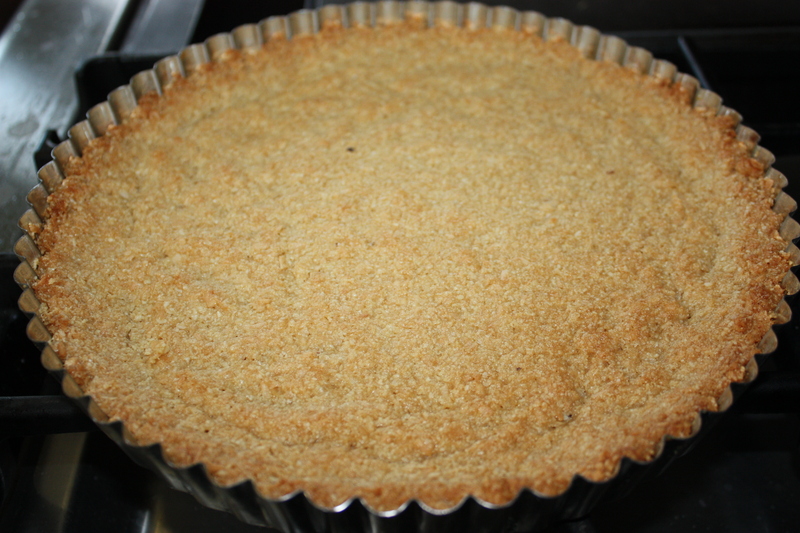 Like this coconut tart! This tart is so delicious and light, but it also happens to be gluten-free, vegan (if you use coconut oil), Passover-friendly, and adaptable to the fruits of the season. 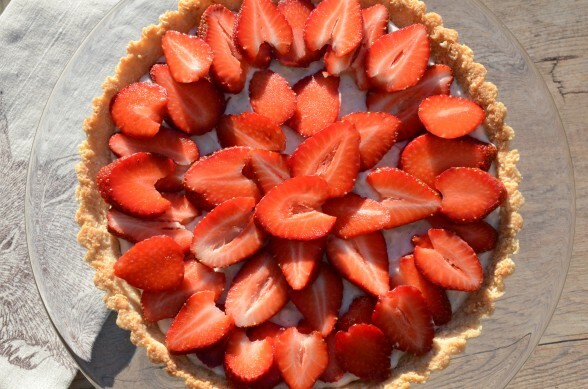 I love making this tart with strawberries now since they are absolutely everywhere and super luscious. But I’m sure you can picture this like a traditional fruit tart with raspberries, blueberries, kiwis, ripe peaches and/or apricots. If you don’t like coconut (seriously? ), you probably won’t love this, but you can always swap your favorite (hopefully not too toxic) crust for this one. The coconut custard is very subtle and not overly sweet, so do give it a chance. For those of you looking to get a jump-start on your holiday baking (I love the way you think), you can definitely make both the crust and the pastry cream 2-3 days in advance and keep both covered in the refrigerator. You can even wash, dry, and slice your strawberries the day before and keep them covered in the fridge, if it makes your life easier. 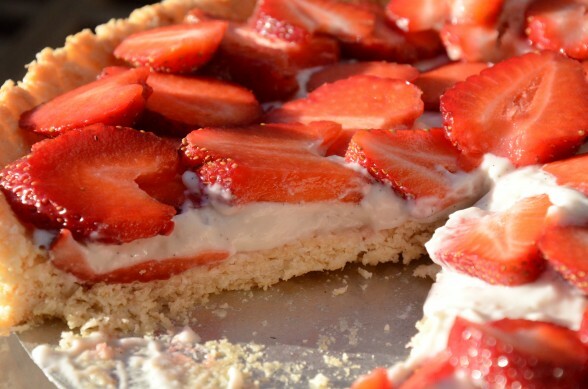 It’s best to wait until the day you serve it to spread the cream on top of the crust to avoid it becoming soggy. Leftovers (what leftovers?) should be kept refrigerated otherwise you’ll run into the same soggy crust issue. For my other two favorite go-to Easter and Passover desserts, check out my Lemon Ice Torte, which I’ve been making since 1991 (gasp!) and Coconut Macaroons. With desserts like these, you won’t be tempted by your kids’ Easter baskets! Make the crust: Preheat oven to 350 degrees. 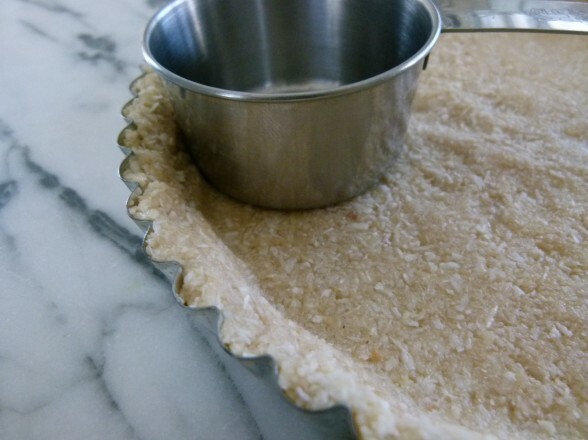 Generously coat a 9 ½ -inch tart pan with removable bottom with butter or coconut oil. Whisk together coconut oil, maple syrup and vanilla until well blended. 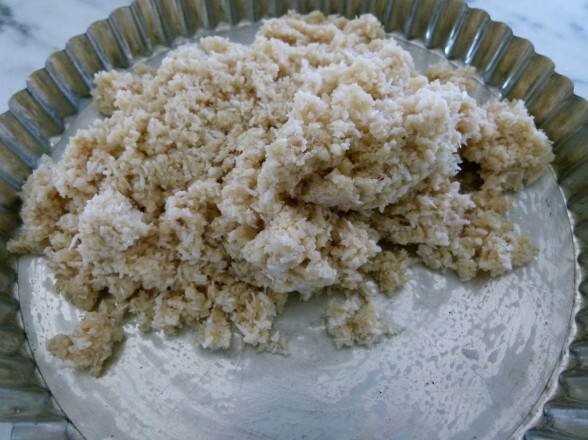 In a mixing bowl, combine almond meal, coconut and salt. Add wet mixture to the mixing bowl and stir to combine. It will be quite sticky. Press into bottom and up sides of pan. Bake for 20 minutes, or until golden brown. Make the filling: Scrape vanilla seeds into a small saucepan, and add pod. Stir in the almond milk, coconut milk, maple syrup and salt. Bring the mixture to a boil over medium heat. Reduce heat to low and simmer for 6 to 8 minutes, stirring occasionally. Discard vanilla pod. 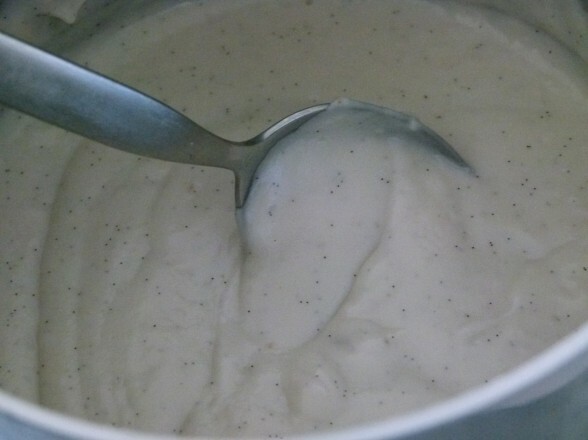 In a small bowl, combine the cold water and cornstarch and whisk until smooth. Pour into the coconut milk mixture and simmer, whisking constantly, until mixture is thickened like pastry cream. Remove from heat and allow to cool. Transfer cream to the refrigerator and chill. Just before serving, pour custard into crust and spread evenly. Arrange berries decoratively on top and serve immediately. Best kept refrigerated. Would vanilla extract work? If so, how much should I use? Thanks! Do you think I can make this recipe into individual serving smaller (4.5 inch) tart pans (with removable bottoms)? Would love to because I already have them….thank you! I tried this for Easter desert and everyone loved it! Even my Gluten eating in laws loved it! The only thing I did different was double the filling to make it bigger. The coconut crust was amazing! I’m so glad to hear that! Gluten-free or not, I think it’s delicious, too! Can you use Arrowroot instead of Cornstarch here? Thanks! Good question! I tried it with arrowroot, and it didn’t thicken as well as the cornstarch. Perhaps I could have tried using more, but I can’t tell you how that would turn out. I figure I almost never use cornstarch and there’s such a minute amount here, I’d rather it turn out well than worry about a little cornstarch.